Standard Chartered is stepping up its open banking capabilities with three new initiatives, with the aim to drive innovation and technology culture through partnerships. The bank’s new initiatives, aimed at the developer community, are as follows. The aXess Platform will offer developers open access to the bank’s open source code for banking products and its APIs, applications, and libraries, the bank says. It serves as an adaptive layer in its technology architecture to drive more connectivity and partnerships between developers, corporations and fintechs, so innovative solutions can be co-created. 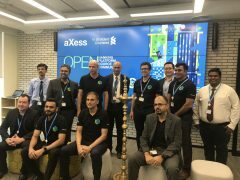 Secondly, aXess Labs is a Bengaluru-based test lab is a physical space where the bank’s in-house developers can experiment with cutting edge technologies, accelerate ideation to service delivery, enable new business models, and share open banking best practices, capabilities, and tools across the bank. Lastly, the aXess Academy aims to upskill the bank’s developers with the technical skills required for open banking through training programmes, hackathons, and technology leadership roundtables. It is also a forum for networking with tech networks in other industries. “Open banking is about putting more choices in the hands of our clients. They can decide what data they want to share, increasing their options of suitable services or products and how they are delivered,” says Dr Michael Gorriz, chief information officer. Following the successful pilot launch of its digital retail bank in Côte d’Ivoire last year, the bank has further rolled out digital-only retail banks across Africa this year, in Uganda, Tanzania, Ghana and Kenya. Most recently, the bank has launched a joint venture with PCCW, HKT and Ctrip Finance to deliver a new standalone digital retail bank in Hong Kong. It also recently announced the SC Ventures Fintech Bridge, a market-first online platform, through which the bank seeks partnerships with fintechs. It will soon be launching an open digital platform for SMEs in India, to help them grow by providing access to a range of financial and business solutions.